This Hunt is for a $2500 Trophy Sika Buck.
. There are several subspecies of sika from China that are spotted, some sika are brown or black The hair is about three inches long on the neck. They have a short tail. Normally a mature Sika will have 4 points per antler. A large Japanese male will weigh 130 pounds and a large Manchurian male will weigh up to 280 pounds. There are about 4 subspecies of Sika in this country. There is the Japanese, Formosan, Manchurian, and Dybowski. They bounce up and down when they run. 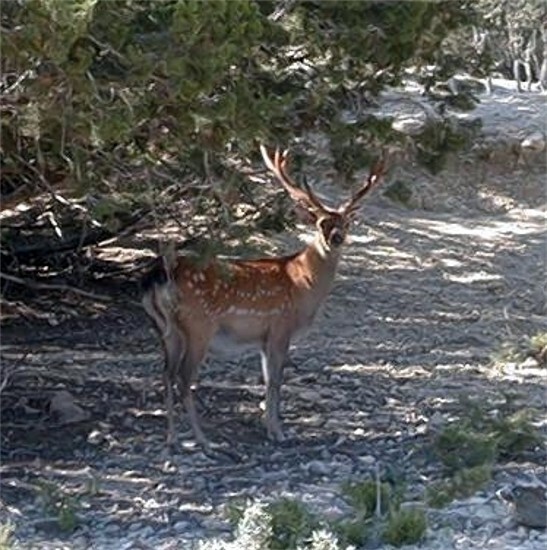 While on this hunt you can also take other animals at addtional fees such as: Aoudad, Axis, Blackbuck Antelope, Corsican, Fallow, Ibex, Mouflon, Texas Dall, Black Hawaiian, New Zealand Mountain Goat, Merino, Painted Desert, Four Horn, Catalina, Whitetail, Hogs, Turkeys, and much, much, more! Bring the entire family and have the experience of a lifetime. We have hunts to fit every budget, from Meat Hunts to Trophy Hunts. The sizes of Trophy Sika Bucks will vary. There will be Trophy Sika Bucks larger and smaller than pictured.